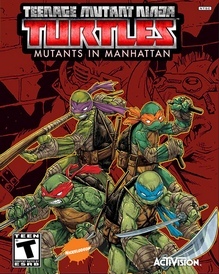 The digital versions of Teenage Mutant Ninja Turtles: Mutants in Manhattan were delisted on January 4th, 2017 for Steam, Xbox and PlayStation platforms. Activision originally announced a multi-year deal with Nickelodeon in February 2013 to release video games inspired by the then-new CG-animated TMNT series. Activision’s name was attached to the TMNT license as early as February 2012, indicating the deal was established or at the least very certain by the time of the official announcement. Between 2013 and 2016 Activision would release five TMNT titles before their license expired. All digital versions of these games were also delisted on January 4th, 2017 or in the preceding months. Both of Activision’s The Amazing Spider-Man games were also delisted alongside Teenage Mutant Ninja Turtles: Mutants in Manhattan which remains available on physical media for PlayStation 3, PlayStation 4, Xbox 360 and Xbox One. •Original story penned by IDW Comic’s TMNT author, Tom Waltz.